Virgin Atlantic has announced that it is cancelling all flights to Dubai from 31st March 2019. As a regular traveller on the route, I always struggled with Virgin. The outbound flight from the UK is overnight which, whilst it may suit some business travellers (albeit you are heading straight into work after 2-3 hours sleep at most), didn’t work for the leisure market. Arriving in Dubai at 8am with no hotel room to check into and sleep-deprived kids is not fun. The British Airways options are not great either, with the first Heathrow service leaving at 12.55 which gets you in very late. The sweet spot is taking the 9-ish services on Emirates or Etihad (to Abu Dhabi, a short taxi ride away) which land around 8pm. As we covered recently, Hainan Airlines has just launched a triangular Beijing – Edinburgh – Dublin – Beijing service using an A330-300. Hainan is now selling Edinburgh-Dublin and Dublin-Edinburgh as ‘fifth freedom’ services, if you want to fly this route with a business class flat bed. It is £81 return in Economy and a stonking £414 return in Business! One-way tickets are also available. Unfortunately Hainan Airlines is not in a major alliance so there is no easy way of booking Business Class with miles. I suspect this would be a very pleasant Economy flight, as a lot of passengers will get off before you board and legroom will be better than a standard short-haul aircraft. InterContinental has opened the InterContinental Phu Quoc Long Beach Resort, located on Phu Quoc island. This is a UNESCO World Biosphere Reserve off the coast of Vietnam. The resort features 459 rooms, suites and villas, its own beach and six restaurants and bars. 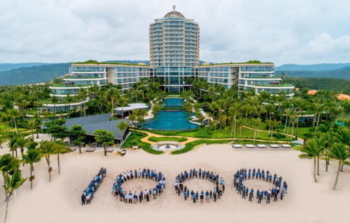 It is the 1,000th IHG hotel in the Europe / Middle East / Asia / Africa region, hence the image above. The hotel website is here. As an IHG Rewards Club redemption it is currently priced at 35,000 points per night, which is good value given that non-refundable cash rates in September start at $220 including tax and service. It provides a direct Beijing outbound and return flight from each of Dublin and Edinburgh without having to go via Dub/Edi if you book the correct day which makes sense rather than the outbound routing being different to the inbound. OT virgin related – What would be the best UC seats on the 787 in people options? Its going to be my first time in UC so want to get the best seats possible. OT but also Virgin related. Rob, do you know when the final Virgin offers for bonus points on the new cards are going out? I have marketing turned on (always have) but haven’t received any correspondence yet. They said 2 weeks which would be up this weekend. British Airways’ parent company, IAG, has astonished the aviation market by launching a new Vienna-based subsidiary airline with less than three weeks’ notice before flights begin. IAG’s new operation is called Anisec. It will be branded as Level – the same as the group’s existing long-haul budget operation. evel’s short-haul flights begin on Tuesday 17 July. On that day flights between Gatwick and Vienna are available at £23 each way. Services start on the same day between Vienna and Palma de Mallorca. Over the subsequent four weeks, flights from Vienna will be launched to six Spanish destinations and three cities in Italy, as well as Paris, Dubrovnik and Larnaca in Cyprus. The latter two routes offer connection opportunities for British travellers from Gatwick via Vienna. The new airline uses Airbus A321 jets – bigger planes than other low-cost carriers. They seat 210 passengers, compared with a maximum of 186 on easyJet and 189 on Ryanair. Willie Walsh, IAG’s chief executive, said: “We are launching this new short-haul subsidiary to provide Austrian consumers with more flight choices across Europe. IAG already has a low-cost short-haul airline, Vueling, which is based in Barcelona. Initially bookings for Level are being made through the Vueling website. Will IAG ever add Vueling, Level and Aer Lingus to Oneworld Connect? What percentage of the ticket price is linked to alliance membership? Aer Lingus I guess yes, unlikely for the other two. Weird! Anika had HUGE fun with Vueling yesterday, so much fun that a compensation cheque has been agreed within 24 hours ….. Surely Anika should keep all compensation as she experienced the issues? Unless you compensate her for her additional time etc? I keep all compensation when on company travel. It’s been a rumour since may. Cheap flights to Vienna this summer though. Abu Dhabi airport to Dubai is a “short taxi ride”??? 78 miles. For comparison that’s more than the “shorter still” taxi ride from Heathrow to Southampton…. 60-odd mins, it’s also a cheapish £40 taxi ride – whereas what would you pay LHR to Southampton, £200? It took us 65 minutes to Madinat Jumeirah last time and a £40 fare. From DXB it is 25 mins. You get some of the extra 40 mins back via quicker immigration too. Thanks for posting that. Its been 30 years since I was last in the UAE but my memory of it was that it was much more than a “Short taxi ride” between Abu Dhabi and Dubai. Not losing my marbles as quickly as I’d feared! It is now direct motorway from the airport into Dubai – that is what has changed in the last 30 years! Yeah, i’ve done the taxi ride to abu from dubai many time given the better flight times (i.e. overnight!). Seems the redemption rate for Ritz-Carlton and St. Regis brands are through the roof. I remember Rob saying SPG high end hotels being expensive (on points) as they are. Even more so under the new program. Keeps hotel owners happy, I suppose. Mostly up for Ritz, and only slightly down like -5000 Marriott for St Regis. Some relative sweetspots like St Regis Rome and W Fort Lauderdale — up significantly. Point 2. Seems that plenty of crappy, convenience airport Sheraton hotels also went up. Domes of Elounda goes from 45k to 85k – crazy devaluation. The new Intercon doesn’t appear to be bookable with the Ambassador Free Weekend Cert. What are the criteria for a hotel being bookable with that? All hotels have to offer it. Probably haven’t got around to it, perhaps email the Ambassador Service Centre and see if they can book it for you. Of course, the published email address ([email protected]) is bouncing emails. Anyone staying in the Jebel Ali, Marina or JBR areas, the plane to hotel often quicker from AUH than DXB depending on arrival time. Al Maktoum airport was good to fly into with Qatar before the fall out! Often felt like the only passengers in the Terminal. OT: I am hopefully about to book a flight using a 121 voucher. The voucher is in my wife’s account and she does not have enough to Avios but I do. I think therefore I need to create a BA household account which I think will let us book the flight we are after from her account. Is that right and if so how long does it take to set up, is it instantaneous? I am also hoping to get 90,000 avios from last weeks Iberia promotion. If there is any availability (and I don’t think there will be!) I think I will need to transfer more avios from BA to my Iberia account to get the flights I am interested in. Are there any issues with transferring from BAEC to Iberia if my account is a household account? O/T – friends flight to New York on Norwegian (operated by a 747 operated by Wamos) has been turned around due to smoke in the cabin. No one has any information for him on board. If flight not fixed tonight what is he entitled to? I’ve been using this site for th last 18 months and this is my first comment. I disagree with your comment on the leisure market. I regularly use the overnight flight to Dubai on BA. I can work till 6.30 in Canary Wharf, get the 9pm flight to Dubai, be beside the pool by 8.30am. Stay overnight Saturday, get a late checkout Sunday and then fly back on the 2am ish flight on the Monday, arrive at Heathrow at 6.30 and be at my desk by 9.30. Two days sun for one night’s stay. I can sleep on planes.